Work: Alderman, New York city; Delegate to the Albany Convention, 1754; Delegate to the Continental Congress, 1776; Later, State Senator in New York, Delegate to Federal Congress until 1778. 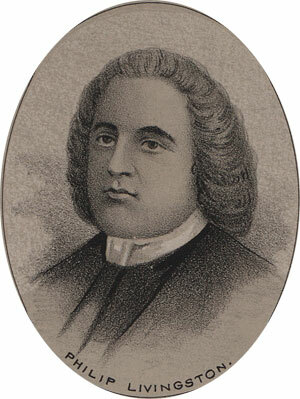 Philip Livingston was born in Albany, New York, on the fifteenth of January, 1716. He graduated at Yale College in 1737, and entered into mercantile business in the city of New York. He was a very successful businessman, and served his community as an alderman. In 1754 he attended the Colonial Convention at Albany. He was selected as a delegate to the Continental Congress in 1776, and was in strong favor of the Declaration of Independence. After the adoption of a new Constitution for New York State, he was elected to the state Senate. He died suddenly while in attendance at York, Pennsylvania.